Nevada Conditional Waiver upon Final Payment. Under NRS 108.2457(5)(c), lien claimants use this form when a required by the client to execute a waiver and release in exchange for or to encourage a customer to make payment of a final billing. The lien claimant is not paid in exchange for the waiver and release (or a single payee check or joint payee check is given in exchange for the waiver and release), so the lien is not actually waived until final payment clears, not including any disputed amount. 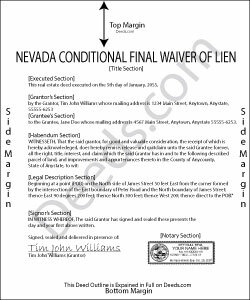 Contact an attorney with questions about lien waivers or any other issue related to mechanic's liens in Nevada. Eric D. said: Very helpful and informative. It has saved me time going to get the forms at county recorder / clerk (as my county and state websites dont offer forms on their sites) and also provided help understanding the uses of the specific deed I needed to use. Reply from Staff: Thank you Eric. Have a great day! Robert F. said: Came with all the paperwork that I needed plus a lot more paperwork than what I needed. Covered all the bases! The instructions were a big help. Easy fill in the blanks. Had no problem filing the paperwork afterword at the County Clerks office. Definitely worth the $20. Reply from Staff: Thanks Robert. We appreciate you taking the time to give us your feedback. Have a fantastic day! Reply from Staff: Glad to hear that Robert. Have a great day!